Pending changes in residential building codes that seek to improve energy efficiency in residential structures could impact the way your home is clad during a residing project -- and lead to an increase in vinyl siding prices. The Department of Energy's 2012 International Energy Conservation Code, or IECC, seeks to add a 30-percent increase in energy savings compared to the IECC code established in 2006. The final determination was filed with the Federal Register on July 19, 2011, and each state has two years from that date to revise residential building codes to meet or exceed the new standard, the DOE says. 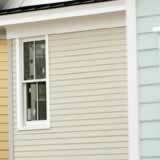 So what does this mean to you if you are considering purchasing new vinyl siding in the next few years? If you home is clad with siding, it probably is built using 2x4 or 2x6 framing, a layer of OSB or plywood sheer panel, a house wrap that acts as a vapor barrier, and then vinyl, aluminum, wood or similar cladding material. The main way the proposed code changes impact homeowners is the goal of improving energy efficiency in low-rise residential structures through the use of continuous insulation. One of the easiest ways to do this is by attaching a layer of foam insulation several inches thick around the structure, similar to the foam base in an Exterior Insulation and Finish System (stucco) home. However, this system presents problems for attaching most cladding materials, engineers note. Common cladding fastening systems aren't designed to attach to foam, and the extra thickness of the foam creates detailing problems with trim and windows. However, despite these challenges, the use of foam insulation is becoming more common -- the Foam Sheathing Coalition, a Washington, D.C.-based advocacy group, estimates that almost 70 million square feet of foam sheathing was installed over wood-sheathed walls in 2009 and projected similar numbers for 2010. An extra step in the construction process means more work, and therefore higher bids for services. If contractors and builders have to install a layer of foam insulation, homeowners can expect to see higher vinyl siding prices. If you are considering a cladding remodel job during the next few years, make sure your contractor is aware of pending changes to residential building codes. By using the pre-screened and certified contractors found through this site, you can guarantee you are choosing a long-standing builder that has an eye on new code issues and new construction methods.